Traits of people born under Hornbeam sign: intellect, intuition, fantasy, artistism. Compatible: Beech, Oak, Fir, Pine, Hazel. Uncompatible: Cartas, Maple & Nut. 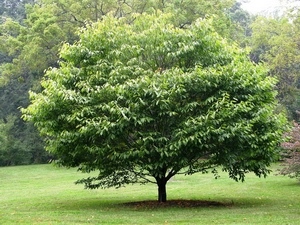 The Hornbeams tree is also called ironwood. That’s because of its enormous resistance. Hornbeam-persons are very tough and rather indestructible. And that in a mental, spiritual and physical aspect. So one should not assume that these people are unfeeling. On the contrary - they are just stable. They are absolutely reliable; and if everyone else turns away from you - hornbeam-born are real friends when you need them. They are always afraid of making a mistake when doing anything. On the other hand, they feel responsible for what they do and tend to be just. This sign does not like departures from the general rule and tend to go round like a horse in a mill. They look at new ideas with caution. They are rather honest in love. Feelings are an important issue for them. This quality makes them lovely and pleasant partners. However, when there is a choice between love and duty, they choose the second, as a rule. Hornbeams-tree-born are people of action. They act, while others are still discussing. They are realists, and they know their limits, they act on clear principles. They aim high, but they never get lost in the clouds. Once the hornbeam has found a clear goal, it’s solid as a rock. Hornbeams-tree-people understand the laws of nature. Their thought and action is strongly marked by that. They live their life with self-discipline, diligence and order. Every kind of excess is alien to them and gives them a feeling of unease. If a grovebeech is kept prisoner of its own discipline to much, they act strongly on the weaknesses of others. They turn sullen, bad-tempered and hard. Hornbeam man is a neat and pedantic. It’s very difficult to get away from the rules, he can not stand it. For him, his impeccable reputation is very important, and for the sake of observing decency he is ready to sacrifice much. In its "correctness" can be boring, but reliable. In the service of such an employee - the dream of the boss. Hornbeam men scrupulously fulfill all orders, follow all instructions, never late and do not delay "smoke breaks". The boss for them is always a very respected person, and labor discipline is above all. Hornbeam are rather vain, but this is expressed not in the desire to "sit up" the leader, but in the desire to receive formal approval of their actions. The size of the salary also plays a role. Such men can be exemplary spouses, but do not expect romantic surprises from them. In addition, they are among those who believe that duty and duty is more important than any feelings there. Hornbeams women are very respectful of decency. They watch themselves, try to look good, adhere to the requirements of fashion, but without the excitement. Extravagant novelties are not for them. They are neat, clean and executive. In their youth, women Hornbeams are very attractive, and by the mature age they become rather trivial. In their personal lives, they are not inclined to seek adventure, serious relationships in their biographies are counted in units. When they get in touch or get married, they think first of all about their own interests. But these are exemplary, faithful and caring spouses, and it does not matter whether they still had some kind of cordial inclination with their husband. Women Hornbeams always try to keep the family, because it is accepted, and this requires decency. Due to their alignment, Hornbeams-sign-born have a natural dominance. They were endowed with the role of the protector from birth on. They honor and love their partner sincerely. Their partner should have a diplomatic talent, and be very understanding. But be careful - the rather difficult character of the hornbeam could lead the weakened partner involuntarily into passiveness.